This is a strange book, one that has beautiful moments I’ve come to associate with Clare Vanderpool, but it doesn’t always resonate with me. At times, the book even feels over-written and abstract with images that are too great a stretch. And I struggled to get a handle on Early. Early Auden is a young boy whose behavior is sometimes simplistic, sometimes remarkably advanced. He kept me puzzled and guessing throughout the entire story. Only after I reached the end of the book did I realize the author had modeled his behavior on what we now define as autism. But as the story takes place at the close of WWII, it has no name or diagnosis. I sort of wish I’d read the author’s note first. It changed the whole way I think of the story…and the story did make me think. Jack Baker finds himself miles from home at the close of the war and after his mother’s death, enrolled in a school for boys. There he meets Early Auden who has a fascination for the number pi. Early sees the sequence of numbers as landscape and color and tells an entire story about the character named Pi that closely follows the boys’ own real-life adventures. But when a mathematician suggests that the number pi might end, Early throws a tantrum. That’s when Jack realizes Early is suffering a loss of his own, a loss he just won’t accept. “Connecting the dots. That’s what Mom said stargazing is all about. It’s the same up there as it is down here, Jackie. You have to look for the things that connect us all. Find the ways our paths cross, our lives intersect, and our hearts collide.” Taken from the epilogue, that’s a pretty good summary of the message of this book. I give this one a recommendation with a minor caution (not against content). 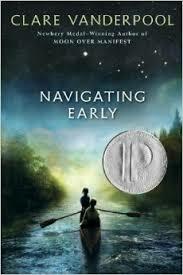 While it’s deep and beautiful and a “thinker”, this book is a little slow, and Early is hard to relate to. Great for diehard readers, but I’d probably point less motivated kids in another direction. I absolutely loved this book. I could tell from the start Early was on the autism spectrum. There are areas I wished moved more quickly, but it didn’t detract from my reading. I found the story between Jack and Early intriguing/inspiring. But her writing is complex and for older kids. I had more trouble getting into Moon Over Manifest, but liked it as well. I think you nailed it, Pat. This one really is for older MG. I really liked the story within the story, too, Erik. It was cleverly done.